How I wish my Aygo Black looked. This is how I wish my Aygo looked. Lower, wider tyres, alloys and arches. 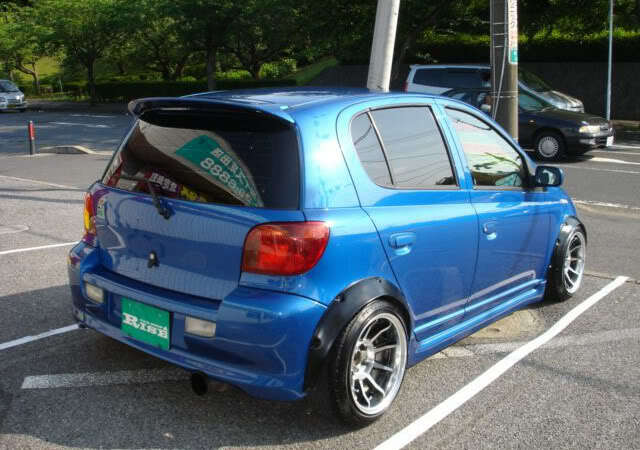 The photo I used to make this, was of This --> Toyota Yaris , although not the same car they are similar so I don't know how plausible this would be to achieve. Last Edit: 14 Sep 2013 01:21 by Alex. Dude absolutly anything is possible stance wise...as most of my cars go i try and get as near perfect fitment as possible which has taken alot of time to perfect but the results are worth the extra time and money. i have a full arche rolling tool if needed dude, and its then a case of measuring and using something like willtheyfit.com to see how far can go width and offset wise. However if you aim for wheels that wont poke out past the arches then you can always add spacers to get the fittment spot on. That looks amazing! A lot of work to blend the arches in I would have thought but definitely worth it. Go for it! Thanks for the replies everyone. I may have to ask for your experties Dazran, when I come into some spare cash to start doing more to my car, that is very kind of you to offer. I think I will find the wheels first, if it's from ebay or some that I like, then make them fit as Superspat suggests haha. The biggest problem with my car is that the bumpers are made of plastic, and they make up part of the arch. I prefer the look of rolled arches rather than plastic over fenders, because it looks cleaner and as if it was made like that. But I understand that this is not easy, so I may have to use plastic over fenders. I don't mind hard work I would rather do a job properly, it's more fulfilling afterwards. I don't know much about car mechanics, but I want my car to be drivable and look good haha. So I have read about stuff such as fitment issues, scrub radius and strain on the bolts, but don't fully understand some of it. I want my car to be lower so it handles better because its like a boat, but also because it looks good. So I am grateful for all the friendly and helpful advice. One question I have is, Does adding spacers affect the handling like turning radius? Also, yeah I though you would recognize it Andy haha, thanks again. Last Edit: 14 Sep 2013 15:51 by Alex. I always think it's better to change the offset of the wheels rather than using spacers where possible. Standard Cappo wheels are ET+45 and my wheels for my project car are ET0. This means I get a lot more poke without having to use spacers. ET+35 – 45 for 13-16 inch rims. ET+37 is ideal. I will have to get my tape measure out, see how much space there actually is full lock and from the suspension etc. I will probably stick with 13-14 inch rims. Last Edit: 14 Sep 2013 17:05 by Alex. You also need a width that will fit lol. Find out what your standard wheel size is and ill tell you where to measure. then if you give me details ill try n work out best size for you dude. If I run big spacers I use bolt on ones so there's less strain on everything. My move is currently running 20mm bolt on hub adapters. Haha oh yeah sorry I forgot about that. The standard wheels are 14 inch and are supplied with 155/65/14 tyres, but You can also fit 195/50/14. Last Edit: 15 Sep 2013 21:05 by Alex. Doesn't give me the wheel width though dude lol. My move wheels are fitted with 165/55 tyres and there 8inches wide, and my bB wheels are 9 inches wide and fitted with 195/45 tyres. And without a stretch you can fit them on any width narrower than that so at a guess should be anything from 5-7j...so a nice small gap to choose from lol.